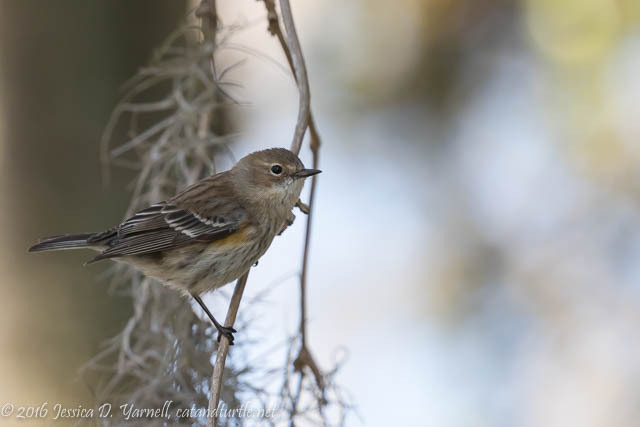 My dad had a rare sighting on Friday at the Circle B Bar Reserve – the strange and elusive Jess-bird! It felt so great to get out with a camera. 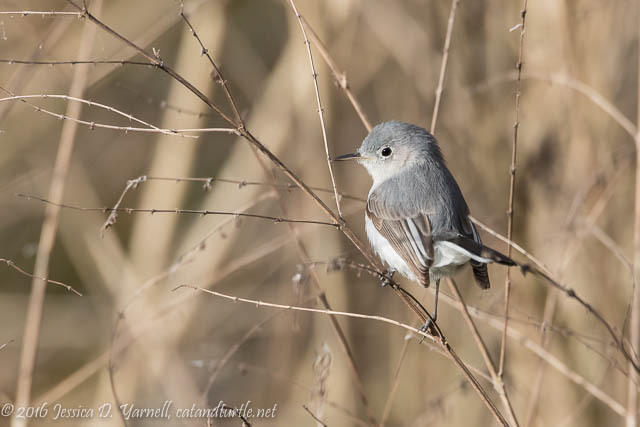 Although the paparazzi were most focused on the Great Horned Owlets and the bobcat, we found that our best subjects were the “ordinary” springtime birds. When we first got out of the cars, we were greeted by a flock of American Robins in the oak trees around the parking lot. While I’ve been hearing the robins flying overhead in Orlando in the mornings, this was my first close-up with a robin this year. The birds were friendly and didn’t seem to mind when I squatted down and inched closer. I doubt they will stick around too much longer. 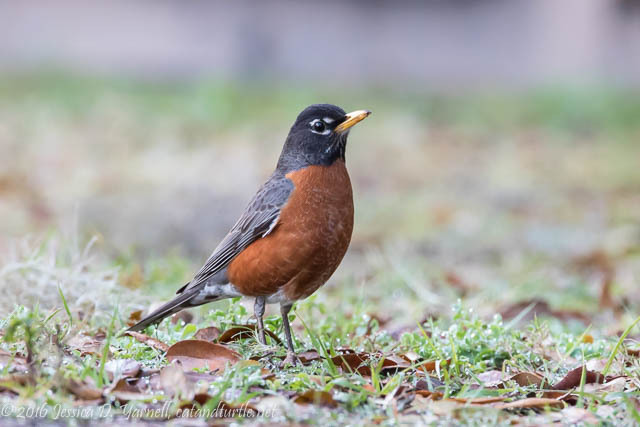 It’s the time of the year when my father-in-law always used to report that his robins were back in Pennsylvania, the first heralds of springtime! 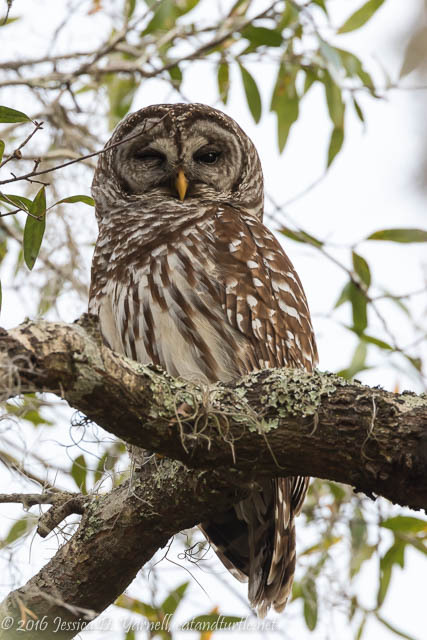 A very cooperative Barred Owl has been hanging out in the big trees at the intersection of the Heron Hideout and Shady Oak trails. He blends in quite well. He also has a nasty habit of posing with a branch right in front of his face! He needs to go to nature photography school. ;-) I wouldn’t be surprised if he’s on watch for a nest nearby. 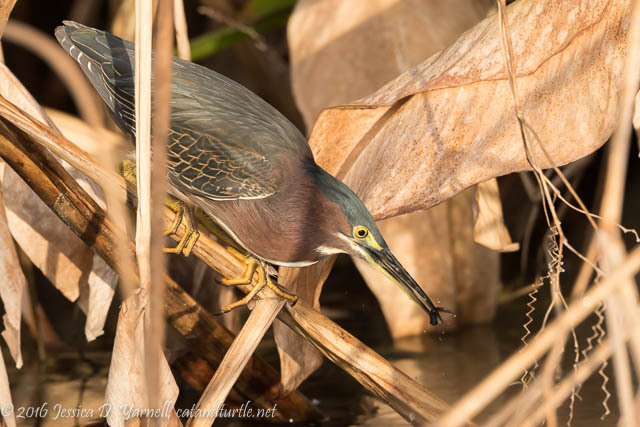 Speaking of blending in, we walked right past this little Green Heron twice before we noticed him. He was fishing out in the front of a clump of bushes. Minnows for breakfast, mmm! It pays to be one of the first people on the trail in the morning. 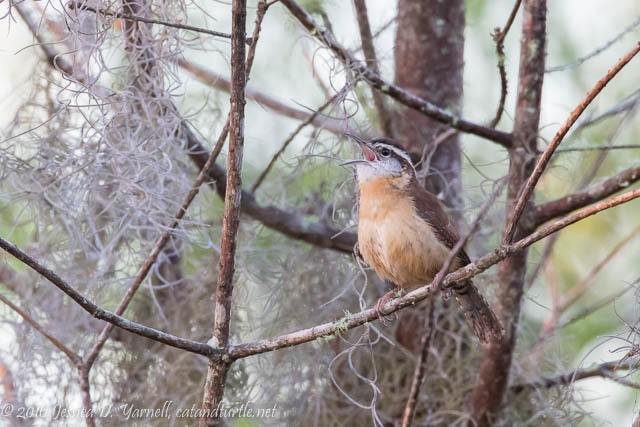 This Carolina Wren was singing his heart out! As soon as another pair of people walked by, he startled and dove back into the bushes. The Northern Parulas were singing, too, and I heard a pair of American Goldfinches. I love the springtime! I saw more Glossy Ibises and Tricolored Herons on this visit than I’ve seen in a while. All the wading birds are starting to get into their breeding plumages, which look lovely in the soft morning light. 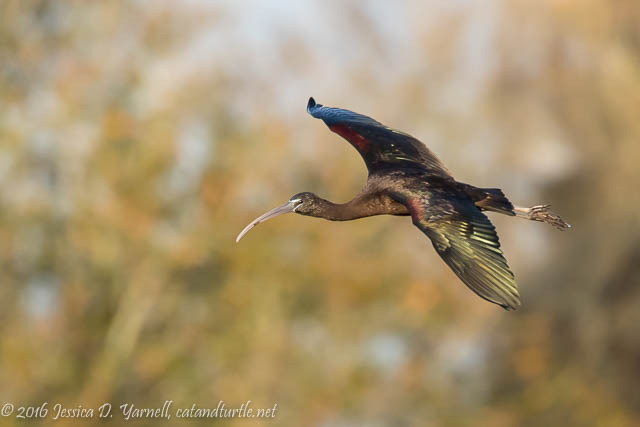 Note to self: remember that the white near the Glossy Ibis’s eye is a breeding plumage thing, not to be mistaken for a White-faced Ibis! Little birds were everywhere! 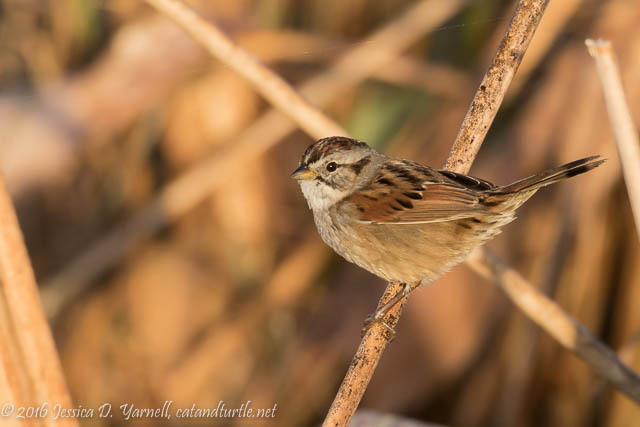 Swamp Sparrows hopped among the reeds, and Blue-Gray Gnatcatchers pretended to be hummingbirds as they fluttered for a bug. 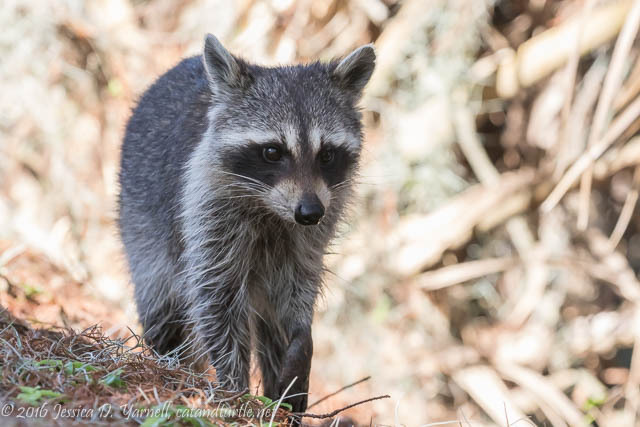 As we neared the Great Blue Heron nest, a raccoon popped out on the trail in front of us. He was not at all concerned about our presence. He meandered along the trail in front of us, giving me ample time to take his picture. Not the elusive bobcat, but still a fun sighting to end the day! Cool photos! I like the Carolina Wren. So very cute … great shots Jess!